When it comes to fresh authentic Japanese sushi there is only one place, Red Fin Sushi. Starting her first business seven months ago, owner Harriet Kim took over Peter’s Place at the Magnuson Hotel just off Highway 3 in Creston, BC. The new Togo menu includes an assortment of sushi along with Canadian cuisine. From Temaki cones and Maki to 28 regular rolls and 20 special rolls, there will be plenty of sushi to satisfy your hunger. You’ll also find Bento boxes, Sashimi, Udon, Tempora and much more. Even Korean dishes. The signature dish is the red fin roll. “Our food is fresh. We start making it when we get orders. Fresh and clean. Also, customers say that our presentation is awesome,” said Kim. If sushi is not for you, the full Western menu may be to your taste. It includes chicken, fish & chips, burgers, veal cutlets, pasta and the old stand-by liver and onions. Mmmmmm good! With the Annual Blossom Festival coming up May 18 – 21st, Kim is excited to offer delicious sushi to festival goers. 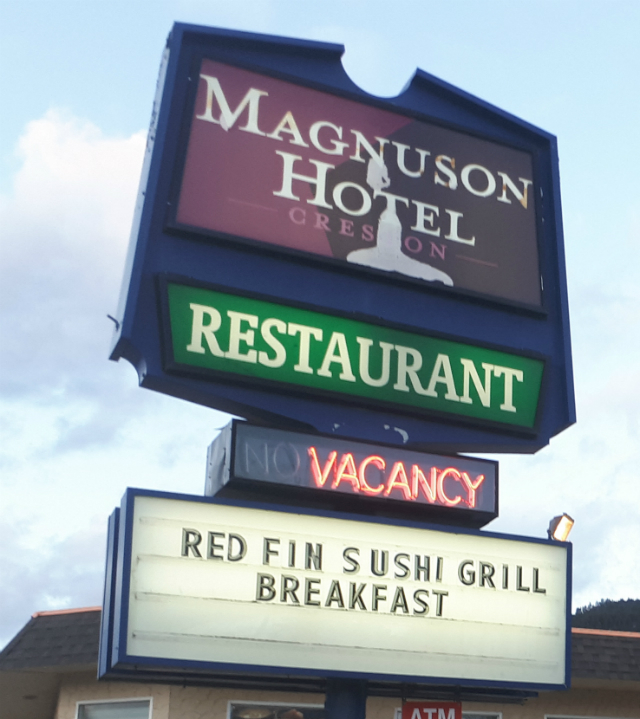 Check out Red Fin sushi, open from 7am to 9pm daily, breakfast, brunch and sushi. The best in town!